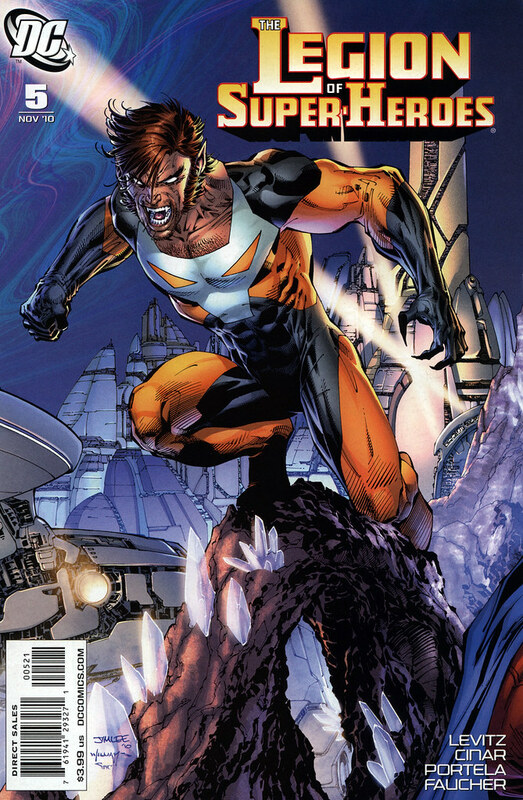 Giant-Size Geek: Jim Lee Legion of Super-Heroes Covers: Mon-El and Timber Wolf! Jim Lee Legion of Super-Heroes Covers: Mon-El and Timber Wolf! A while ago I had featured the first 3 Legion of Super-Heroes variant covers by Jim Lee, featuring Saturn Girl, Superboy, and Chameleon Kid. Here are some nice scans of the next two covers. 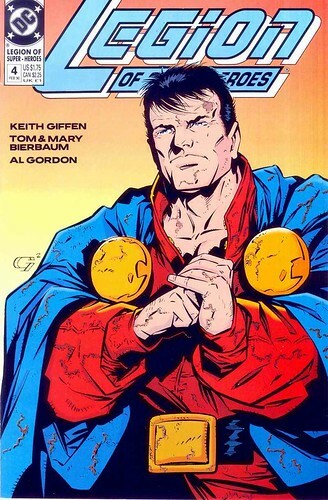 Mon-El represents the 1990s "Five Years Later" era of the Legion, when Keith Giffen took over the creative direction and plunged the team into a darker storyline. 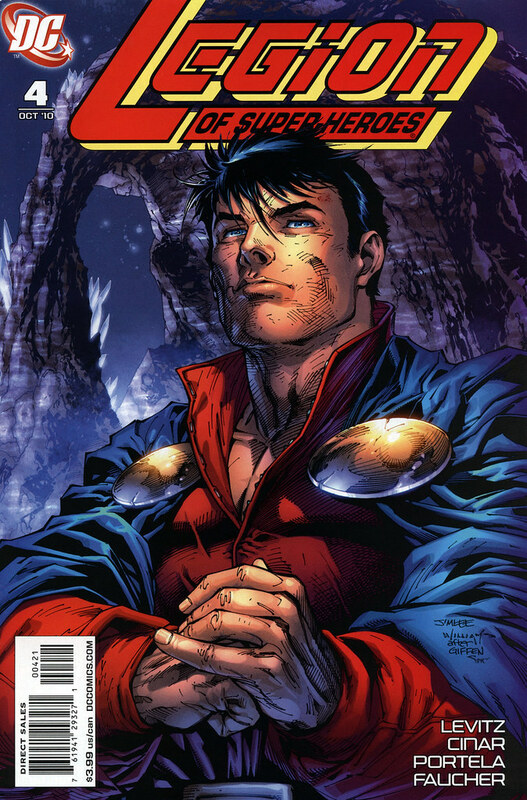 If you are a longtime Legion reader, and you think you may have seen Mon-El in this pose before, you are correct. Jim Lee signs this cover "after Giffen". Jim Lee shared on TwitPic that he used this Giffen cover, from the 1989 Legion of Super-Heroes #4 issue, as a model. I love the way Mon-El's hands and pinky are drawn, like he's cracking his knuckles before a big fight. Those big kooky discs holding his cape to his uniform are something else. Notice also that the logo on Lee's variant cover is the same as the 1989 edition. In fact all the logos on the variant covers are taken from the past! Legion of Super-Heroes #5 features Timber Wolf, and this era represents the 1980s Paul Levitz / Steve Lightle / Greg Larocque era. Timber Wolf has always been a favorite of mine. He goes in and out of love with various creators, but I think Lee has produced one of the best drawings featuring the character. Rob Liefield may have been the one who prompted Jim Lee to chose Timber Wolf with this Twitter message. 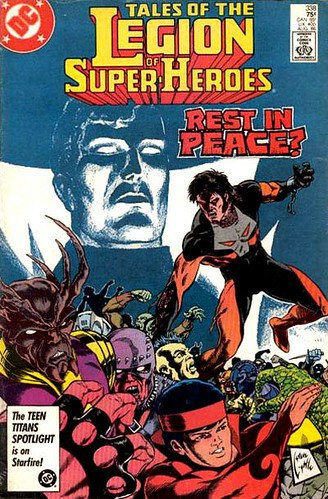 While this cover isn't directly inspired another, here's an interesting one to compare against: Tales of the Legion of Super-Heroes #338 from 1986. Nuff Said!